This infographic checks the pulse of web design today. Like most recent years, this one's been a busy one when it comes to web design. Each month we've seen new tools and apps emerge and change the industry landscape. To help us all take stock, the team at Market Inspector have picked the brains of 40 experts and rounded up their findings in a handy infographic. Between them, the experts came up with 15 key trends that have shaped 2018 so far. Ranked in order of importance, this list covers chatbots, VR integration, video content and more. Which ones will continue into 2019? Only time will tell. Check out the infographic below. Do you agree with the experts? Or have they missed a crucial web design trend? If you're after extra information on each of these trends, the experts have shared more detailed insights over on the Market Inspector site. 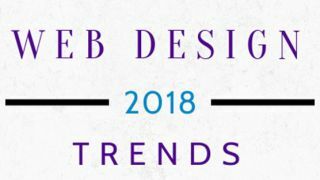 Breaking down each topic one by one, the minds behind the infographic give a reasoned look at why each trend was included. Bold colours and gradients appear to be the standout trend to take note of, while custom images and mobile designs continue to be important factors to consider. Virtual Reality is low on the list, but it's still worth taking note of. A lot can change in 12 months so who knows, perhaps it will be on the up in 2019.